Lara Giddings, the attorney general for the island state of Tasmania, said the kangaroo-like marsupials were getting into poppy fields grown for medicine. She was reporting to a parliamentary hearing on security for poppy crops. Australia supplies about 50% of the world’s legally-grown opium used to make morphine and other painkillers. All I can say is: MAN, those wallabies are amazing! I suspect this anomaly is not limited to Australia, and you don’t necessarily need stoned wallabies. The United States is perhaps the most drugged-up nation in the world. And all these prescription pills go through everyone’s digestive systems and are excreted through the body into the sewage system. And the idiots who run the sewage system decided to pump that sludge through a filter and reroute it back into the WATER SUPPLY system! But the drugs and hormones from the waste water is not filtered, and no one knows what dire results it has on the health of the population. See, it’s not too complicated– all those prescription drugs are right back into the water supply! People everywhere– but especially in the United States, where crop circles are just as abundant as the painkillers– are in a drug-induced stupor. 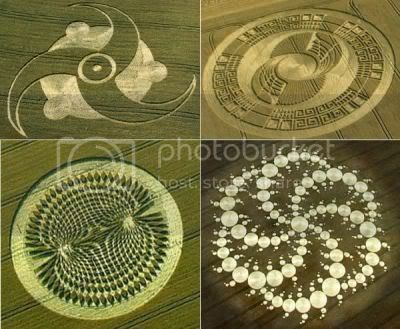 Combine this with the availability of things like flattened cardboard and tennis rackets, and it’s very easy to see how crop circles are formed in the dark of night! P.S. Gives new meaning to the work “poppycock” doesn’t it? Bwahahahahaha!